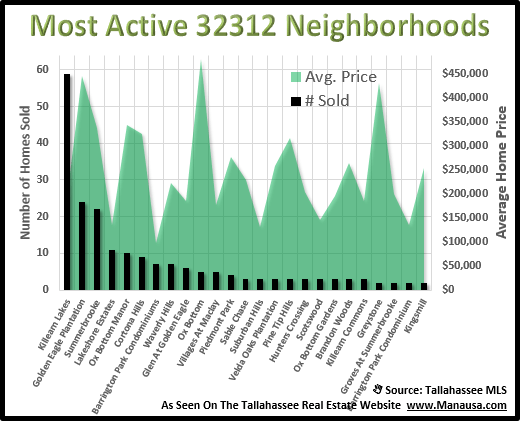 Northeast Tallahassee is the hottest segment of our local housing market, and the 32312 zip code contains much of the action. The average home price in this highly sought after zip code is $278,000 and the average home value is currently trending up to $124 per square foot. Today's report takes a closer look at where people are buying within the 32312 zip code and what they are paying in the most popular neighborhoods. The real estate graph below shows the most active neighborhoods in the 32312 zip code. Starting from left to right, we see unit sales in 2014 (black bars measured on the left vertical axis) and average home prices (green shade measured on the right vertical axis). Killearn Lakes Plantation is the clear leader in the 32312 zip code. Our next graph shows that home values have been rising steadily since hitting a bottom in 2012. 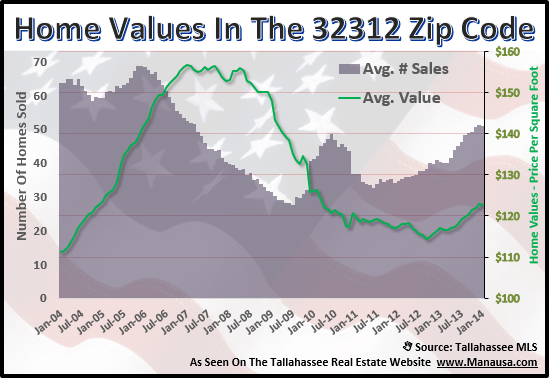 Currently, we can see that the average value of a home sold in the 32312 zip code has been about $124 per square foot (more than double than what the Tallahassee Democrat erroneously reported in their recent report on Tallahassee home values). While the recovery is well under way for the 32312 zip code, home values are still down about 21% since the housing market peak in 2007. This shows that there are still some great values to be found by buyers. The following list shows the 10 most recent 32312 home listings in the Tallahassee MLS. The following table shows the most active neighborhoods for home sales in the 32312 zip code thus far in 2014. Note that the table can be sorted by each column heading. I hope you enjoyed the 32312 zip code report and we are always here to serve you whether buying or selling in this popular segment of the Tallahassee real estate market.